Our guest contributor this week is Pat Barch, the Hoffman Estates Historian. This column originally appeared in the December 2016 issue of the Hoffman Estates Citizen, the village’s newsletter. The column appears here, courtesy of the Village of Hoffman Estates. Finally, after so many years of trying to find out who built the Lion Bridge, I now know who engineered that beautiful little bridge. His name was Harry L. Emerson, an engineer who worked for Cook County back at the turn of the century. Not only did he build our Lion Bridge but he built the first reinforced concrete arch bridges in Cook County. Seven of them were across the Des Plaines River. According to his biography in the History of Cook County dated 1909, his two most notable bridges were built in Wheeling and Lemont, Illinois. They also had animals on them and the Lemont, or Stevens St. Bridge, built in 1906, was so beautiful that it was a destination point for visitors to the Chicago area. The bridge in Wheeling, or the Dundee Rd. Bridge, built in 1905, was identical to our Lion Bridge only longer in its span across the Des Plaines River. The Stevens St. Bridge was torn down and the Dundee Rd. Bridge was widened and the Lions and decorative outlining of the bridge were destroyed in the process. All that’s left are the photos found on line and at the Wheeling Historical Society. I have to thank Randy Schallau who found the name of engineer Harry L.Emerson while doing research into the mystery of who built the bridge. Randy had lived in Hanover Park at one time and had read about our difficulty in finding any information about the bridge. Research is a hobby of his as he’s retired from his work in construction and living in the north woods of Wisconsin. He knew that bids for work in the construction of buildings, roads or bridges could be found in the Engineering News that dated back to the late 1800s. He located me and e-mailed what he had found. That was a great day. After all the years of finding nothing in newspapers or government records, we finally found who had built the bridge. The request for bids for the Lion Bridge and the Stevens St. Bridge in Lemont were in the same issue of Engineering News from 1906. As far as we know, none of Mr. Emerson’s original bridges remain except for the Lion Bridge located at the southeast corner of Route 59 and Golf Rd. It is already recognized as a historic bridge but I’m now in the difficult process of applying for National Register status. More research is required and with a bridge that’s 110 years old, it’s a time consuming process with little to be found. Old maps from 1890 show that there was a cheese factory and the Bode Hotel located at the northwest corner of Bode Rd and Sutton Rd (now Route 59). 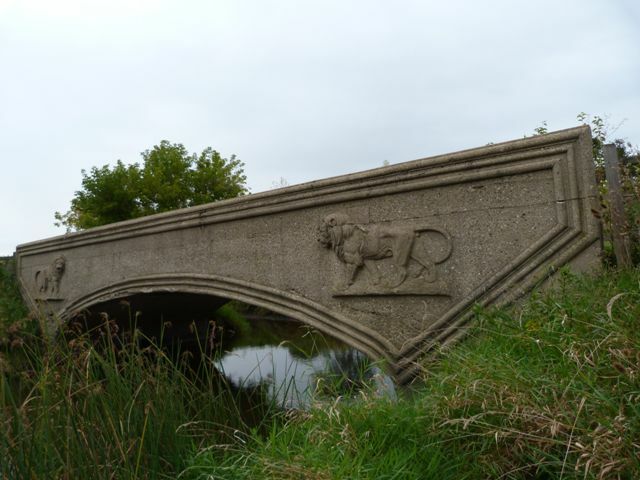 Golf Rd did not exist in 1906 when the Lion Bridge was built. It was an important bridge because dairy farmers would take Sutton Rd across Poplar Creek on the Lion Bridge to Bode Rd stopping at the cheese factory or on to Elgin. Known as the Elgin to Chicago Rd, Bode Rd. is one of the oldest roads in this area. Farmers would take Bode Rd to Elgin with wagons loaded with milk bound for the dairies in Elgin. Please join us on Saturday, Dec. 3 at 10 am at the Lion Bridge to celebrate its 110th birthday. A small parking area is located at the north east corner or Bode Rd and Route 59 and we’ll tailgate with coffee and donuts, walk down to the bridge and sing happy birthday to our much loved bridge. Our guest contributor this week is Pat Barch, the Hoffman Estates Historian. This column originally appeared in the September 2013 issue of the Hoffman Estates Citizen, the village’s newsletter. The column appears here, courtesy of the Village of Hoffman Estates. The mystery of the Lion Bridge remains. It is baffling and hard to understand how such a beautiful bridge was built for the use of farmers who needed to transport milk to local creameries and cheese factories in the area. Wouldn’t a simple bridge be more practical and less expensive? Many people, including myself, have searched newspaper achieves in Elgin and Palatine for a story that would have announced the opening of the bridge in November of 1906. Nothing has ever been found. The records from Hanover Township have never been found and are assumed lost or were discarded long ago. Only the old Cook County Board reports gave us the cost of the bridge, $3000 shared between Cook County and Hanover Township, but not who built it. Preparing the forms that would have included the 3 dimensional lions would’ve taken much skill. Was the concrete poured into the forms onsite or was it done in a nearby town and hauled there? We investigated bridge builders that built bridges in neighboring Schaumburg Township but got no were with that. Wouldn’t you work with a river town such as Elgin for skilled bridge builders? All of these questions have gone unanswered and the mystery remains. Who built the bridge and why are there no other bridges like it? The bridge, known as the Lion Bridge for its 4 lions that adorn the east and west sides, is located at the southeast corner of Route 59 and Route 58. Over the past 106 years it has seen a lot of traffic. Milk wagons, hay wagons, and other farm traffic would soon include motorized tractors, trucks and cars. Route 59, also known as Sutton Rd., went up and over Route 58. The little Lion Bridge would be used to cross the Poplar Creek and access route 59. The road and the bridge were only one lane wide. Drivers would pull over to the side of the road if another car was coming toward you. In the early 70’s the highway department changed the intersection, tearing down the Route 59 bridge over Route 58 and building a new bridge over Poplar Creek with the two highways intersecting at ground level. 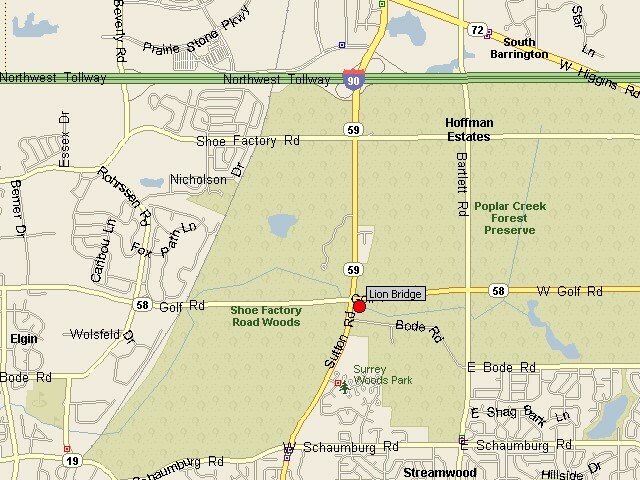 The Lion Bridge was abandoned by the highway department and it became the property of the Cook County Forest Preserve. Only horses and people cross the bridge these days. Hanover Township Director of Community Relations, Tom Kuttenberg, told me of plans to erect a historic marker at the bridge site. 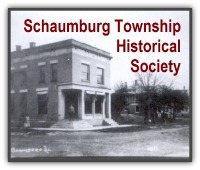 This will be part of their Hanover Township Heritage Marker program. It is tentatively planned for the fall once permission is received from the Village of Hoffman Estates and the Cook County Forest Preserve District. I will also move forward with plans to fill out the forms and send photos of the bridge to Springfield to ask for National Register status in spite of the fact that we can’t tell them who built it. Getting historical recognition for the bridge will be a wonderful way to celebrate the 100th anniversary of the Cook County Forest Preserve.